getcalc.com's Slip Speed Calculator is an online electrical engineering tool to calculate the difference between synchronous (ns) & actual speed (n) of AC induction motor. The required input parameters & values are synchronous & rotational speed in RPM. 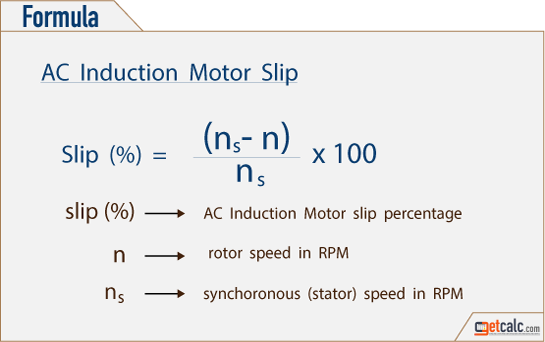 Slip Speed of an AC induction motor is a small difference between the synchronous speed of the rotating magnetic field and actual speed of the rotor, generally measured in RPM. The difference multiplied with hundred and divisible by the synchronous speed is called the slip percentage.